All those punishing hills have payed off. Hour after hour, mile after mile, you've proven your dedication to two-wheeled living, and this is your reward. The Twin Six Martyr Jersey isn't a one-trick pony, it's designed to keep you riding to your heart's content without restricting your style. Featuring eye-catching designs, Twin Six's line of jerseys are all made right here in the United States of America from 100% polyester microfiber, delivering lightweight breathability and exceptional moisture wicking for outstanding comfort. Sublimated graphics keep the eerie silhouetted print looking good for years to come. Complete the look with the matching bib shorts. 100% polyester microfiber construction is lightweight, breathable, and moisture wicking. Full-length hidden zipper for on-the-go adjustment and ventilation. 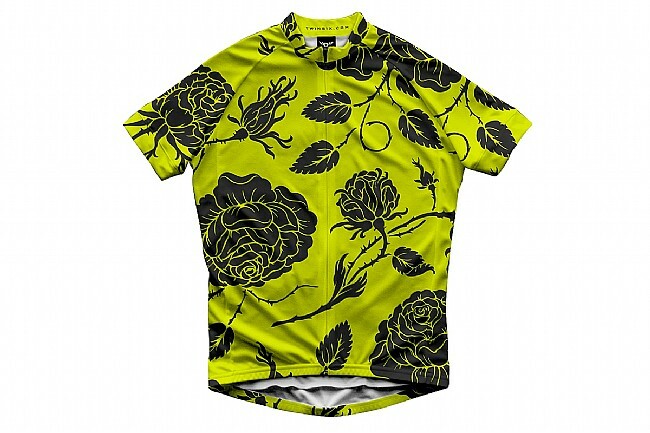 Modern, eye-catching designs that stand out from typical cycling apparel. Three deep rear pockets offer ample on-the-bike storage. Chest 0" 35"-37" 37"-39" 39"-41" 41"-44" 44"-47"
Highly visible. Highly durable. Protects you from the sun. And I fell in it and it took no damage. Its a favorite of favorites.